In the advertising business, agencies like to avoid pitching after 3 PM. 3 PM is known as the beginning of the “dead zone.” However, if you worked in an office on the client side or were attending a presentation, 3 PM was the ideal time. That’s generally a low-energy point in the day for many people. You could just come in sit back and listen, pretend to take a few notes, be polite and enjoy a few snacks. One thing I’ve learned is that many people have different dead zones, for instance, for my wife SuperK it’s from 7 AM to 11:59 AM. The key is knowing exactly when you’re dead zone is and planning your best work outside of it. By “best work,” I mean things that will require the most focus and brainpower. Knowing your zones is equally important if you work at home and need to stay self-motivated, or if you work in an office where people are clogging up your calendar with useless meeting invites. Over the years, I’ve attended all kinds of time management seminars, they generally revolve around making long list of things to do and prioritizing them. I have come up a simple process that basically divides the day up into three parts: Prime Time, The Dead Zone and Home. You can call them what you want, the key is to identify your zones. Prime time- when you are at your best, ready to roll. The Dead Zone -when you hit the wall. Home- winding down the day attending to life so you don’t go to bed worrying. Before we start filling in a day, let’s talk about “the list.” l’ve seen all kinds of crazy time management and prioritization schemes just for making lists. Some of them are in 300 page books that leave you with “managing the list” as your biggest chore of the day. The best to do lists are simple. Apps and smart phones got some very creative people rethinking how we make lists. 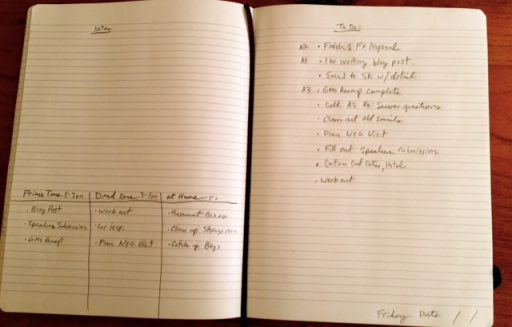 The key component in any list is simply remembering stuff you need to do. The list should be thought of as a giant catchall of things you need to do as you remember you need to do them. The best solutions automatically sync your smartphone with your desktop app and/or tablet. Basically, one list available in many places. I use Apple Reminders on my iPhone and that automatically syncs with the app on my desktop and in iCloud. Prior to that, I used gTasks which syncs nicely with Google tasks in the browser as well as on Android phones, iPhones and other devices. The key here is not to look at your whole to do list at one time. You want to use the list and pull off the most important items of the day and things you are passionate about and put those into Prime Time. Try not to load your Prime Time up with too many items or any long meetings. 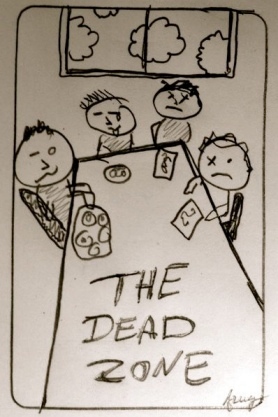 Most office meetings should be pushed into the Dead Zone or avoided if possible. Make sure you block out a chunk of your Prime Time on the calendar so you can avoid someone scheduling a meeting during that period. The third zone on my list is “Home.” Home is in the evening is when some people get their second wind. These are the things that we look forward to, dinner with family and friends, catching up on reading, attending to hobbies and around the house projects. Generally, I enjoy doing a lot of these things so the energy comes more naturally to get them done. Okay, here’s what mine looks like. Keep in mind your Dead Zone may be at an entirely different time of the day. I plugged in a few examples of to do’s and types of to do items. One item that works well for me in the Dead Zone is 20 minutes of exercise. This can be as simple as a walk or high-intensity training, it’s up to you. The key is that it happens daily. A quick workout or walk is also a great way to bust through the wall of fatigue that often hits people in the afternoon. Even better is a power nap or, as many older wiser cultures practice, a siesta. Or in my case, both. A note about commuting; If you spend more than 40 minutes a day traveling to and from work you may think of your commute as a Dead Zone. Unfortunately, this coincides with many peoples Prime Time, especially if you are a morning person. There are fantastic tools available to recapture this time including free podcast subscriptions on any topic, audiobooks from companies like Audible.com. You can get a Bluetooth adapter for most cars that lets you listen to this over your car’s speakers. Please don’t be the person that drives around with headsets or earbuds in. Try not to waste this time with morning DJs or talk radio. The only thing worse than listening to the news (with a humorous or politically biased twist) on your radio is having to listen to the people who call in with their various rants and opinions on what we should do about taxes, the Middle East or the price of gas. If you have an interest in the news, that’s fine, there are a lot more efficient ways to get caught up during your “Dead Zone”. Don’t waste your Prime Time on news or talk radio. I use a Moleskin notebook to pull for five- seven important items off my digital to do list and prioritize them. Then, I plan my top priority items for Prime Time. Simpler, or low priority items can go in the Dead Zone. For example, I usually plan my next day at the end of my Dead Zone, as pulling items from my list is a pretty easy activity. I also clean out emails, and check industry blogs in the afternoon. These two items work well together as cleaning out my email usually generates a few to do items for the next day. It’s a good idea to batch similar types of activities (blogs,email,to do’s) together as you’ll find it helps you get into a daily flow especially as you need to push through your Dead Zone. So, at the end of the day, my schedule for the next day looks something like this, The items on the right, I pulled off of my catchall to do list, and then simply batched them into my Prime Time, Dead Zone and At Home categories. Well, that’s it, my entire time management system to get stuff done in less than 300 pages. I’d love to hear if anyone else has come across something similar or wants to share what works for them.